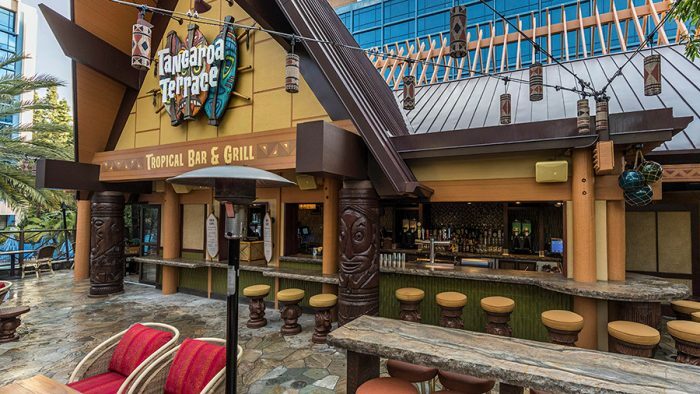 After several months of refurbishment the former Tangaroa Terrace Restaurant at the Disneyland Hotel has reopened as the Tangaroa Terrace Tropical Bar and Grill. Along with the new name comes an updated menu as well as other new features. 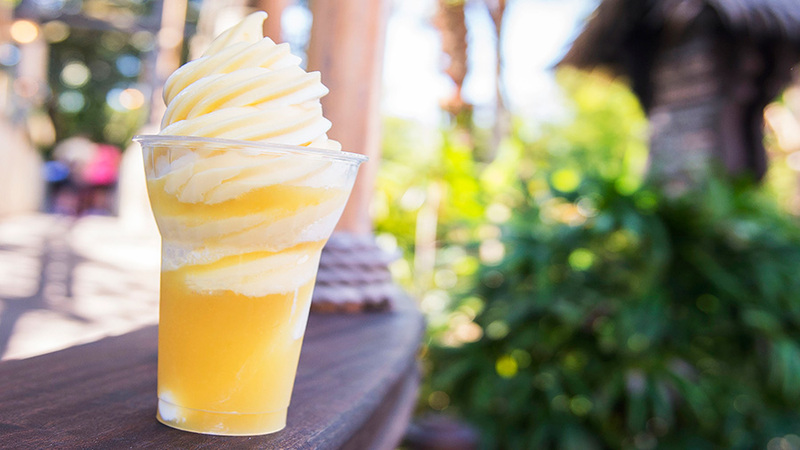 Tangaroa Terrace is still a quick-service location serving breakfast, lunch and dinner. But in addition to ordering at the counter, it’s now a Disneyland Mobile Order location and guests can order and purchase their meals from the Disneyland app. Grab and go items are also available, including snacks, selections of pastries and cookies, and bottled beverages. 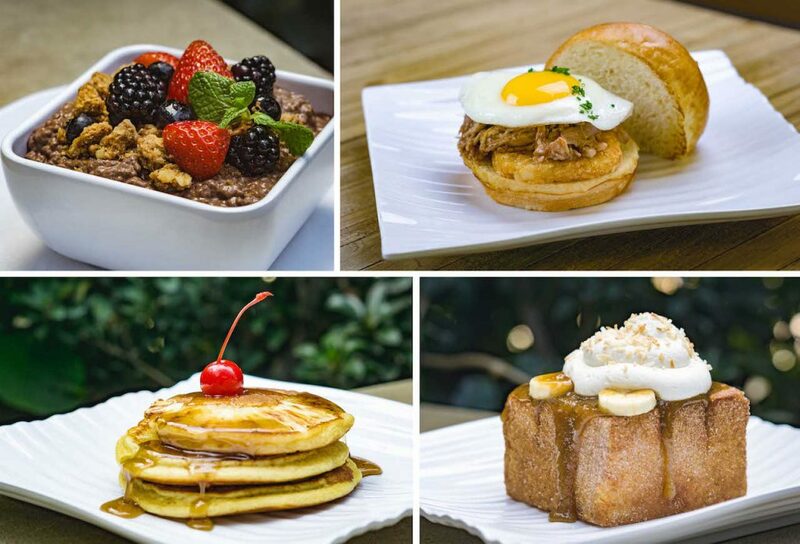 The breakfast menu still offers a breakfast platter, but features new items like a breakfast sandwich with Kalua-style pork, Tangaroa Toast stuffed with bananas foster and topped with whipped cream and coconut, Pineapple Upside Down Pancakes and a vegan-friendly Acai Chia Breakfast Bowl. The lunch/dinner menu includes returning favorites such as the Pu Pu Platter, Pork Gyoza, and Hawaiian Cheeseburger. They are joined by new offerings like Fried Spam Musubi, Kalua-style Poutine, and Shipwreck Nachos. Perhaps the biggest change is outside the restaurant: the new express walk-up window. No food is available, instead the window offers “Coffee Express” from opening until closing and Dole Whip and a walk-up bar from 11:30 am until closing. Yes, this means you can order Trader Sam’s tropical libations, as well as beer and wine, from this window, as well as Dole Whip in cups, floats – or with rum added. Specialty coffee beverages such as lattes, cappuccino, and iced beverages are also available here. 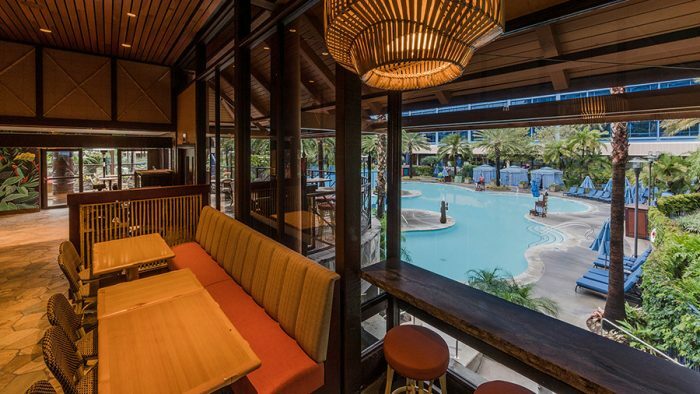 The interior and exterior feature new tropical decor – colorful murals, wicker and woven grass looks, and lighting fixtures. More seating is available both outside and in than before, and includes traditional booths, tables, and chairs, comfy cushioned sofas and armchairs, and the addition of counter seating with bar stools. What do you think of the new Tangaroa Terrace? Have you had a chance to sample any of the new offerings? Let us know in a comment below! Previous PostPrevious More Acts Announced for Garden Rocks Concerts at Epcot Flower and Garden Festival!